We are reckoned as eminent Digital Earth Clamp Tester trader from India. Our Digital Earth Clamp tester induces a test current into earth systems and measures ground resistance in multi ground installations without needing to disconnect the ground. These tester come with Backlit LCD display for the improved display. Designed with flat core ends they prevent dirt to settle, ensuring measurement integrity and improved reliability. 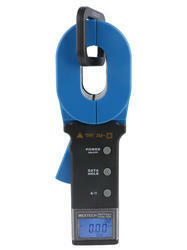 We are offering a wide range of Digital Earth Clamp Tester. It is an electrical device having two jaws which open to allow clamping around an electrical conductor. This allows properties of the electric current in the conductor to be measured, without having to make physical contact with it, or to disconnect it for insertion through the probe. Current clamps are usually used to read the magnitude of a sinusoidal current, but in conjunction with more advanced instrumentation the phase and waveform are available. Very high alternating currents are easily read with an appropriate meter; direct currents, and very low AC currents are more difficult to measure. Long Jaw size: 65mm x 32mm. The unique long jaw is particularly suitable where grounding is done by flat steel or copper strips. Display 4 Digits LCD, 47 x 28.5 mm in length. Over range (OL Ω) as well as low range (L0.01 Ω) indication. Low bat indication and Data hold facility. Double insulation level and also protected from External magnetic as well as Electric Field. Single Measuring Time: 1 Second. Approx 1320 for long Jaw size. Measures Earth Resistance at electrical ground rod and grid. Use for testing quality of grounding without disconnecting the ground rod under test. Conduct field surveys fast and effectively and retrieve and analyze readings at a later time. Use on telecommunication Tower’s grounding. Useful in finding earth fault such as discontinuation or loose contact of earthling strips or cables. To find the resistance of earth pit. 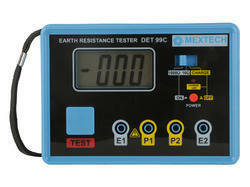 'MEXTECH' Digital Earth Resistance Tester is designed to measure the resistance if earth used in power circuit, Telecommunications, Railway Electrification, Domestic and Industrial electrical installations. The tester measures directly the resistance of the earth andalso measure the ground resistivity. The study, elegant and compact body makes the instrument portable, easy to use, Hand-held instrument.